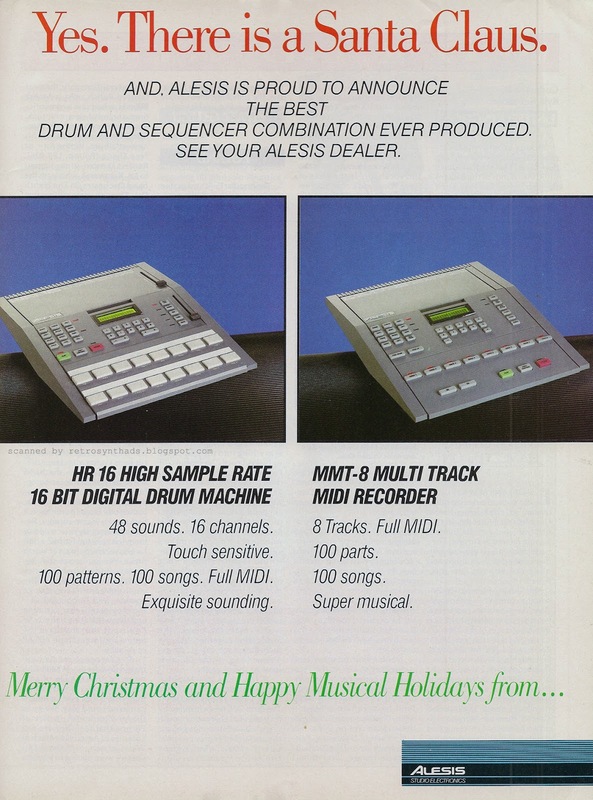 Alesis HR16 drum machine and MMT-8 sequencer "Yes there is a Santa Clause" full page colour advertisement from page 19 in the November 1987 issue of Keyboard Magazine. Surprisingly, very few companies take advantage of the season to customize their marketing message during the holidays. It makes sense since it requires extra time and money to produce an ad that will only get used for one or two months max. But I've come across a few holiday ads that took the chance and made it happen. Sequential Circuits kept it simple in their black and white quarter-page holiday advertisement that ran in the December 1985 issue. Sequential made the decision to split their marketing dollars into two quarter page ads on two different pages so that they could keep their holiday message totally separate. Nice work. 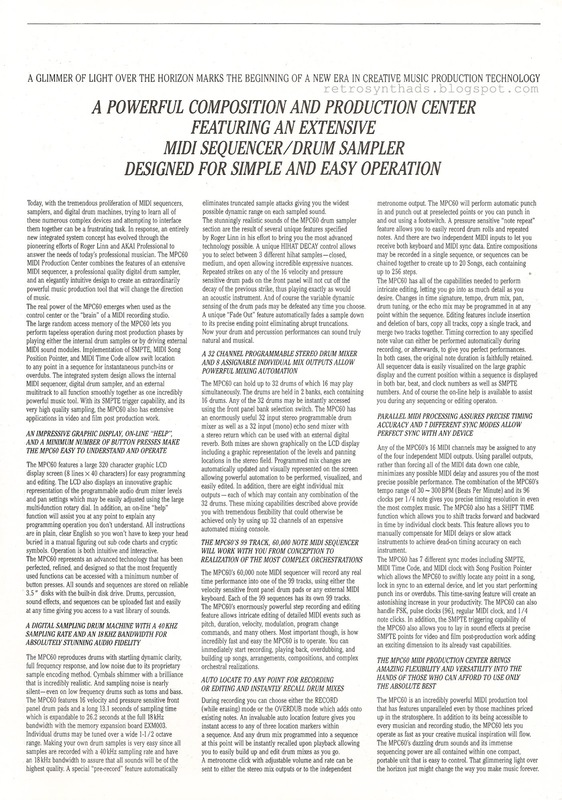 Oberheim took it a big step further in their full page colour ad in the same December 1985 issue when they took out a full page colour product-oriented ad on the back-inside cover. It's definitely Santa/Christmas themed, but its not a message to readers. It's a full on product-oriented ad. But Alesis... they took it one step further. 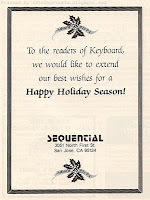 It's not just a "Merry Christmas and Happy Holiday" message like Sequential's ad. 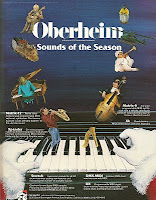 And it's not a holiday product ad like Oberheim's. 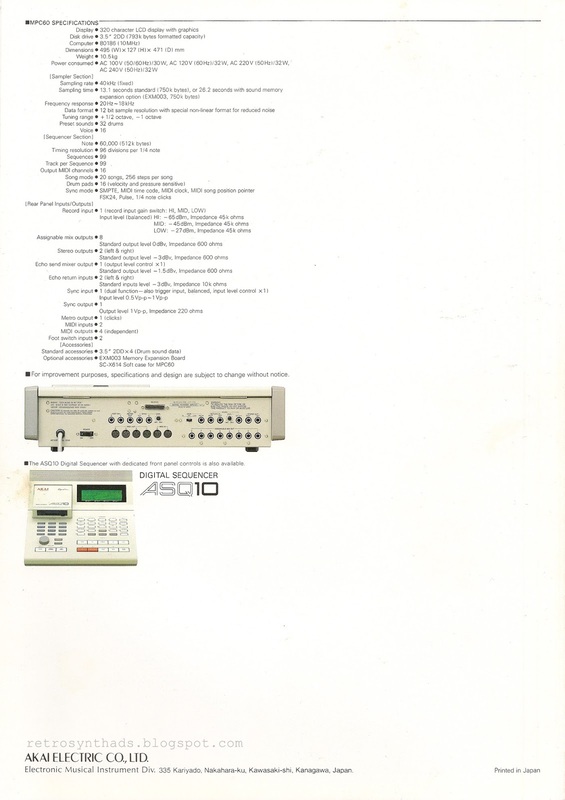 This advertisement is actually THE LAUNCH of the HR16 drum machine and MMT-8 sequencer. 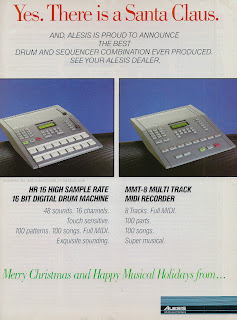 Alesis took advantage of the timing of these two pieces of gear to create a holiday season product launch. Surprisingly, they kept the ad pretty bland. Ad title. Announcement copy. Two photos with some specs. And a holiday message. With some red and green font colours to make it a bit more festive. 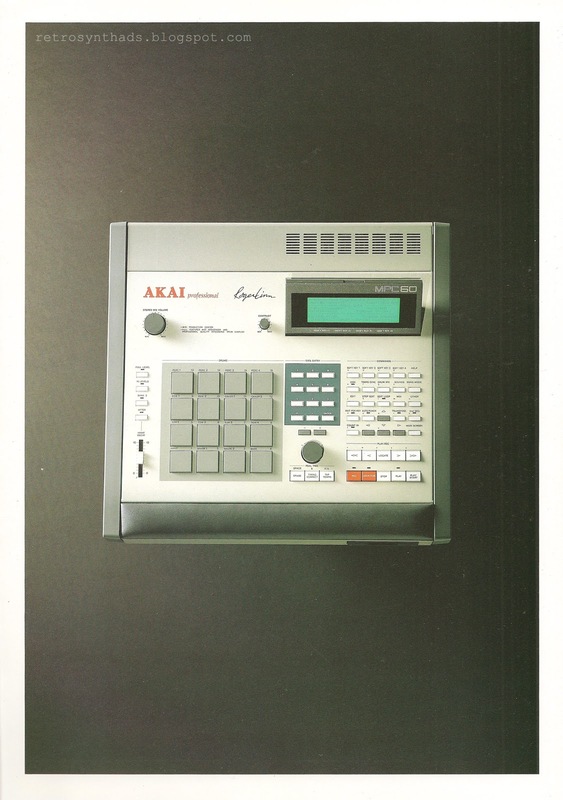 Akai / Roger Linn MPC60 "MIDI Production Center" four page colour brochure from 1988. As I mentioned in my previous post on the first MPC60 advertisement, I wanted to make sure I covered off the 30th anniversary of the MPC60 before the end of 2018! And that definitely includes this lovely brochure. Now, before I say anything else, I just have to first point out that this is one of the classiest gear brochures of its time period. The paper this brochure is printed on is thick and creamy - like a milkshake! I've seen business cards printed on much thinner paper. And its like I can still smell the high quality ink of the printing press from which this thing flew out of. And those two logos on the cover! If I have one small grip about the design of this ad, its probably the small font used on the inside cover page. But then again, there's a lot to be said when you pretty much create a whole new market category - drum machine/sampler/MIDI sequencer (dare I say groovebox?). Can't read the text? Right-click on the image and open in a new tab. Then magnify to 100%. OR however you do that in your browser. Read that whole page and I'm sure you will agree. Yeah yeah... sure, sure... there were a few other tools that came before it that could sample, make beats or whatever. But this thing really brought it all together in a fun and intuitive format. Point being - and there's no getting around it - if you were at a trade show or in your local music store and the person behind the counter handed you this brochure, you would immediately sense it was something special. But that cover would only hint at what was exactly on offer, tempting you to flip the page. And when the victim person opened the brochure and received what amounts to a prefrontal cortex brain-punch by that high quality photo of the MPC60 on the inside, anyone would be hard-pressed not to figure out a way to get the five grand required to take this machine home. 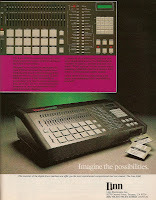 Now, a lot of people try to say the MPC60 is a direct descendant of Linn Electronics' Linn 9000 that came out in 1985. The Keyboard Spec Sheet said as much in my previous post. 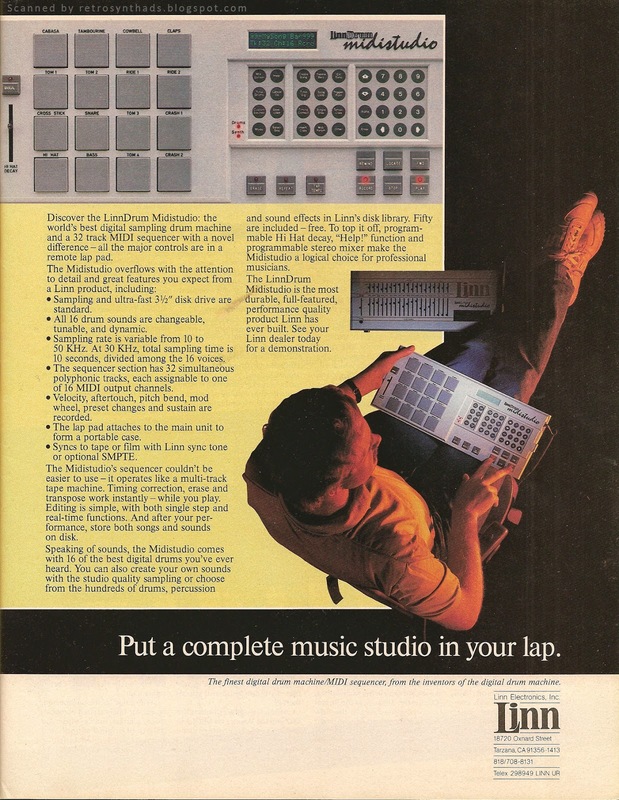 But in my view, it was the 1986 advertised-but-never-released LinnDrum Midistudio that is the real baby daddy. And I'm willing, along with a few others, to die on that hill. 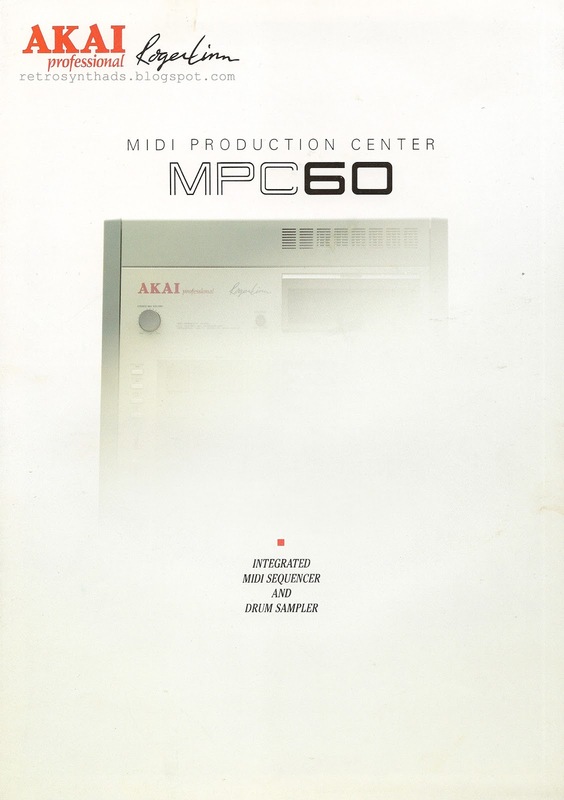 The history of the MPC60, the circumstances around Roger Linn's partnership with Akai, and many other interesting nuggets of knowledge can be found all around the Web with a simple Google search. So to get you started, here's Red Bull Academy's November 2017 article by Lance Scott Walker includes some great history and quotes from Roger Linn as well as many famous users of the MPC60. Another recent article written by Alexander Acimen for VOX celebrating the 30th anniversary of the machine is also a nice read. There's tons more. Just Google. I can't do all the work for ya - I have another MPC60 advertisement to scan.